Larry will be honored in August at the Nišville Festival in Serbia (8/8/19 - 8/11/19). He will receive a Lifetime Achievement Award for being the only jazz musician from the former Yugoslavia, residing and performed with numerous greats in the US for over 60 years. 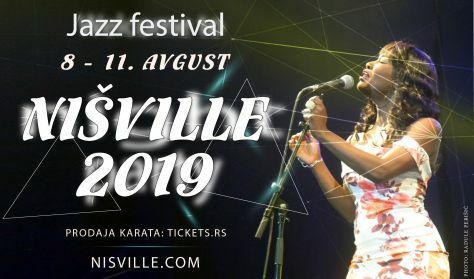 Larry is scheduled to appear at the Nišville Festival in Serbia as a guest soloist with the big band. 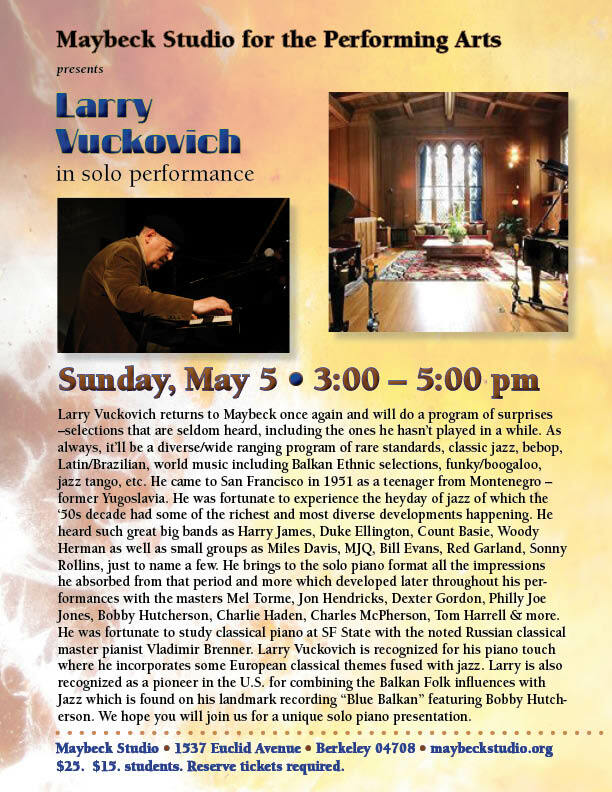 Larry will also present a jazz piano workshop. 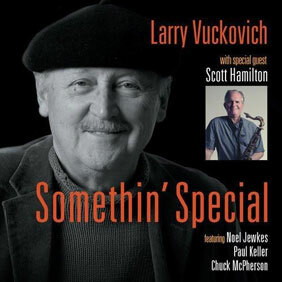 Somethin' Special (2011) Somethin' Special creates a strong 'Blue Note' flavor of soulful, swinging jazz. The selections reflect the pianist's important early influences, honoring the jazz masters who inspired him when he first began playing jazz. High Wall Real Life Film Noir (2008) High Wall: Real Life Film Noir is the sequel to the Larry Vuckovich Street Scene, which placed #1 on XM Satellite Radio for six weeks and hit the Top 10 of JazzWeek and college radio charts. Street Scene (2006) Street Scene distills a lifetime journey through jazz of a versatile pianist who has performed with many jazz giants of yesterday and today. 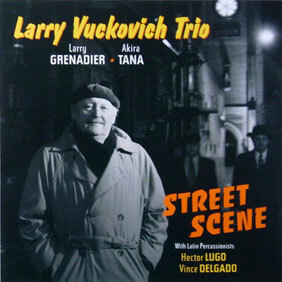 Larry Vuckovich has worked with the likes of Dexter Gordon, Philly Joe Jones, Tom Harrell, Bobby Hutcherson, Charlie Haden, Charles McPherson and others. Called by Barry Harris "one of the premier west coast pianists." You can hear selections from Larry's latest CDs, Somethin' Special, High Wall, Street Scene, Reunion, Blue Balkan", and Young At Heart", check out photos, see Larry's scheduled appearances, and more. Enjoy the hard-swinging, post-bop, contemporary jazz and world music from this exceptional musician's site. Listen to Marian McPartland's Piano Jazz Show featuring Larry. While in New York Larry also performed at the Lincoln Center's Dizzy's Coca-Cola Club. Also check out the Chuck Sher's newly released "European Real Book" featuring "the best in contemporary jazz from Europe" which includes two of Larry Vuckovich's originals and compositions from other famous musicians such as Toots Thielmans, Joe Zawinul, Django Reinhardt, Victor Feldman and others. Lastly, listen to audio samples of many of Larry's releases! Jackie Ryan, called by Jazz Times "One of the outstanding vocalists of her generation, and possibly of all time." She will be singing her amazingly diverse program of swinging standards, Latin/Brazilian classics including beautiful boleros, sambas plus blues, soulful selections, and her beautiful romantic ballads. 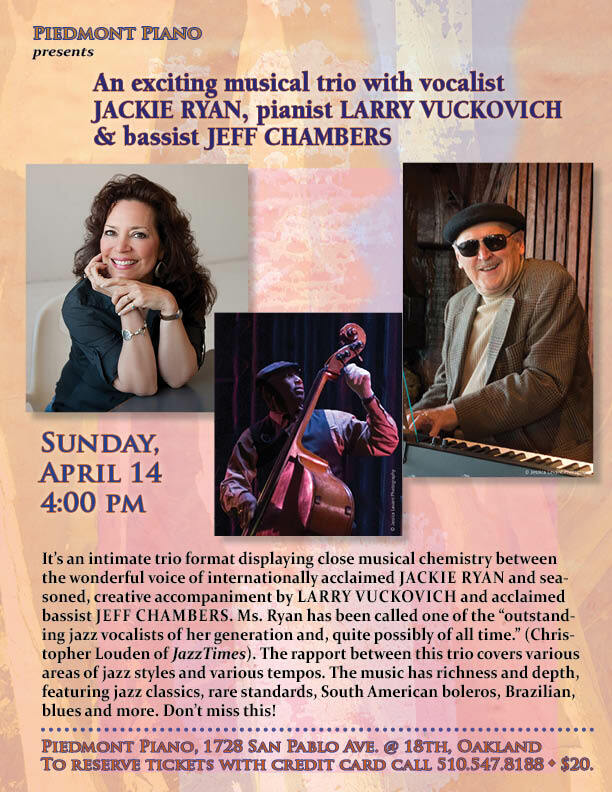 This trio combination with pianist Larry Vuckovich and bassist Jeff Chambers, showcases close musical chemistry. There have been performing since the 90s and have developed a powerful presentation. Don't miss this special program at Piedmont Piano where they always attract a large audience. Refreshments including various wines and cheeses are available. We suggest you reserve your seat before this sells out. Jackie Ryan, called by Jazz Times "One of the outstanding vocalists of her generation, and possibly of all time." She will be singing her amazingly diverse program of swinging standards, Latin/Brazilian classics including beautiful boleros, sambas plus blues, soulful selections, and her beautiful romantic ballads. Larry Vuckovich All-Star Quartet includes Rob Roth, tenor; Doug Miller, bass; Jason Lewis, drums and Larry on piano. Bodega Harbor yacht club is an attractive setting and the detailed info regarding tickets and other points is included in this email. This promises to be a very special night of jazz! Larry Vuckovich returns to Maybeck once again and will do a program of surprises- selections that are seldom heard, including the ones he hasn't played in a while. As always, it'll be a diverse/wide ranging program of rare standards, classic jazz, bebop, Latin/Brazilian, world music including Balkan Ethnic selections, funky/boogaloo, jazz tango, etc. He came to San Francisco in 1951 as a teenager from Montenegro – former Yugoslavia. He was fortunate to experience the heyday of jazz of which the '50s decade had some of the richest and most diverse developments happening. He heard such great big bands as Harry James, Duke Ellington, Count Basie, Woody Herman as well as small groups as Miles Davis, MJQ, Bill Evans, Red Garland, Sonny Rollins, just to name a few. He brings to the solo piano format all the impressions he absorbed from that period and more which developed later throughout his performances with the masters Mel Torme, Jon Hendricks, Dexter Gordon, Philly Joe Jones, Bobby Hutcherson, Charlie Haden, Charles McPherson, Tom Harrell & more. He was fortunate to study classical piano at SF State with the noted Russian classical master pianist Vladimir Brenner. 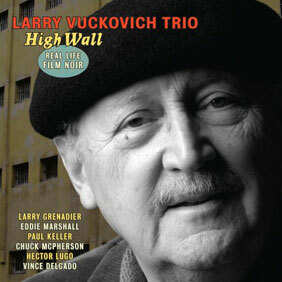 Larry Vuckovich is recognized for his piano touch where he incorporates some European classical themes fused with jazz. Larry is also recognized as a pioneer in the U.S. for combining the Balkan Folk influences with Jazz which is found on his landmark recording "Blue Balkan" featuring Bobby Hutcherson. We hope you will join us for a unique solo piano presentation.